One of my highlights of the 2012 Transition Network conference was Dave Chapman’s presentation on the new powers that the recent Localism Act and the changes to the planning system in England and Wales potentially give to Transition initiatives. 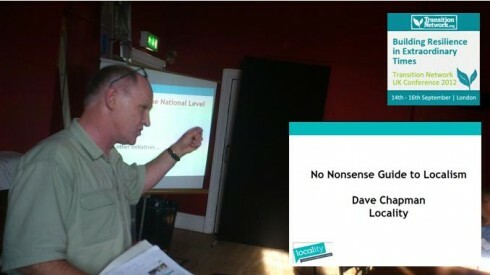 I mentioned it in my conference round-up, but Dave has since sent me his slides, so you can download them (Locality No Nonsense Guide to Localism) and listen to the audio below, which Dave has re-recorded since the conference to get the most up-to-date version possible. If you live outside England and Wales this probably won’t be that interesting, but if you do, this is pretty much essential listening. My thanks to Dave for his slides. This is really timely and interesting. Thanks for posting.